It’s time for North Carolina to drive our federal dollars into our North Carolina communities. 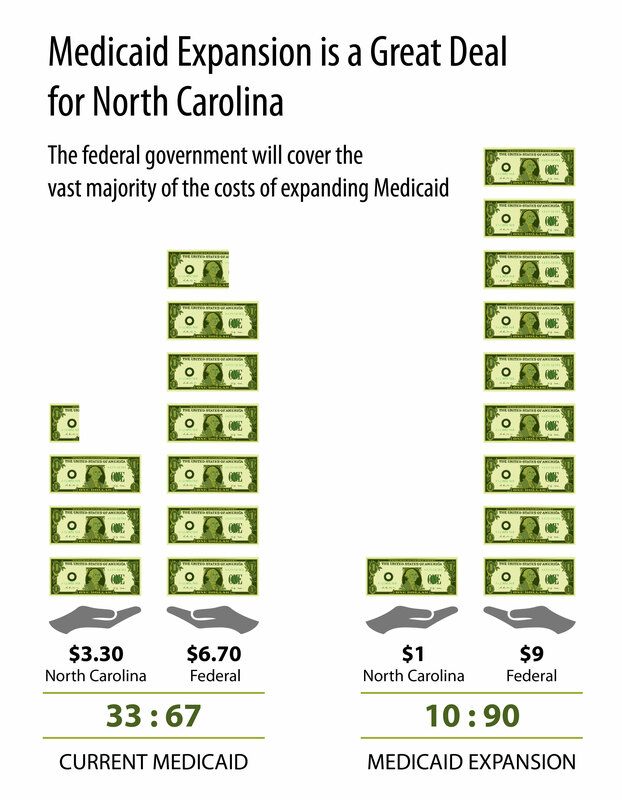 Currently North Carolina receives 67 percent of the cost of its Medicaid program from the federal government to deliver health care services to those who are currently eligible. However, under Medicaid expansion, the state would receive a 90 percent federal match, and the state would be responsible for only the remaining 10 percent of costs. Through the enhanced match, the Governor’s office estimates that the state would receive $1.9 billion in federal dollars to cover the $2.1 billion needed for Medicaid expansion in FY 2020 and $3.7 billion in federal dollars the following fiscal year for the $4.2 billion estimated cost. “…the federal match assistance percentage for a state… shall be equal to…90 percent…in 2020 and each year thereafter”. As several health researchers have noted, history shows that these match rates are durable even in environments where some would seek to cut spending or reduce care. Historically, while the federal government has cut the Medicaid budget a dozen times since 1980, it has reduced match rates only once, in the 1980s, and then only temporarily during a recession. More commonly the federal government increases its support to states for Medicaid, as it did in 2003 and 2009, in order to alleviate state budget deficits. Congressional support does not exist for reducing the enhanced match. For a Congress to consider lowering the enhanced federal match rate, it would face major political obstacles. Thirty-six states and the District of Columbia have expanded Medicaid; those states, their budgets, and their representatives now rely on the federal match. As recently as 2017, a proposal to reduce the enhanced match for Medicaid expansion was defeated while Republicans held majorities in both chambers of Congress. The enhanced match provides the opportunity for states currently covering certain services under the existing match to achieve cost savings. Additional cost savings for certain services provided through the Medically Needy program, Medicaid for pregnant women, and the Breast and Cervical Cancer Control program would qualify for a higher federal match as a result of expansion. These costs savings have been realized in a number of states. Savings in other budget areas are anticipated as a result of increased compensated care as the number of uninsured individuals decreases. The enhanced match rate reflects nearly $4 billion each year in federal dollars, during full expansion years, that would flow to North Carolina communities by providing affordable health care to those who need it and improving the financial stability of hospitals and the larger health care system.